On the 1930 Franklin Co. Arkansas Census, Caleb was listed as a trapper. This name has been spelled Cintha, Cyntha, & Cynthia on various census records It is spelled Lyntha in Clay Co. KY Marriage Index, Bk 1. Her birth year has been recorded as 1814, 1816, 1818, & 1819. Although the 1880 Owsley Co. KY Annotated Census has Cyntha born in Perry Co., Perry was not formed until 1821. 1850 Owsley Co. KY Census, HH 75 - Cintha, 1819. 1880 Owsley Co. KY Census, Dist 79, HH 184 - 1818. Clay Co. Marriage Index, Bk 1, Clay Co. Historical Society - License date. PAGE: P. 17A HH 62. Headstone at Griffith Cemetery as observed by Betty Thomas Finger. BURIAL: St Louis City Cem. This person was know as "Annie". Ref. - Joyce Link, g/d of Annie. PAGE: Henry Gabbard Cem. - for daugh. Nadean. James T. LEWIS , Jr.
|--James T. LEWIS , Jr. This James Lewis was said to have fought in the War of 1812. James T. Lewis, descendant of James Lewis & Sarah "Sally" Couch. Information from Luther Ambrose collection. Headstone at Liberty Cem. at the Missionary Baptist Church near Egypt, KY, and Death Certificate on Ancestry.com. Headstone at Liberty Cem. at the Missionary Baptist Church near Egypt, KY.
Janet Foster, d/o Mildred Cline/Overman & Minter "Tom" Thomas. 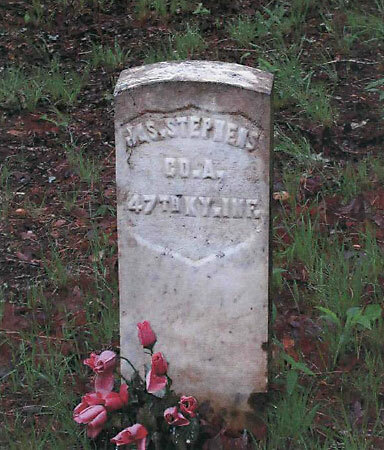 See headstone at Hawkins Flat Cemetery, or Susie's Place. - (Picture courtesy of Ernie Matlock). 1860 Jackson Co. KY Census, My Div., McKee P.O. HH 333 - 1838, KY.
Reed Thomas of Jackson, KY, son of Lora Clay & Shelby Thomas - 1915 Lexington. Haddix Cemetery records at the Breathitt Co. KY Library. Judy Tate, descendant of Vincent W. Thomas & Sarah "Sally" Spivey.